Hi there, everyone! It’s been a very, very long time since I’ve posted. School and a new job (exciting, I know!) got in the way. All of my apologies being said and done, it’s time for a new post! I’ve been in the market for a new car for a while, but it was only recently that I started test-driving. I will be posting my reviews of the cars I test drive here…stay tuned! And of course, I’ll tell you what I end up buying (lips are sealed until then). Until then, here’s my reviews of a 2015 Subaru Forester and a 2014 Subaru Outback. 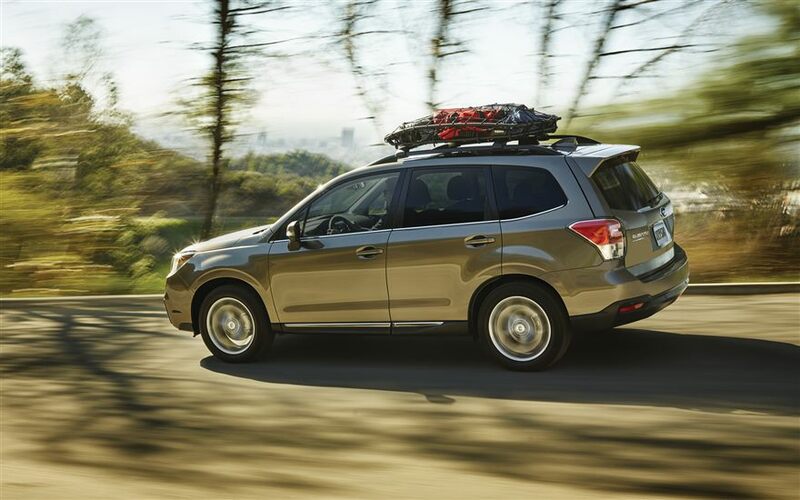 2015 Subaru Forester: The Subaru Forester is a staple for many Americans. It’s a very capable compact SUV in a lot of areas. It’s got a lot of room for whatever you might want to put in the back. I could easily take a couple of friends camping without having to fold the rear seats down. Fold the rear seats down, and you could sleep in the back! If the trunk does get dirty, it’s easily cleanable. Visibility is amazing, thanks to large, airy windows that give the impression of the interior being much larger than it is. That feature is great for taller people like me. The only downside to so many large windows is that it takes a while to heat up or cool down. If you’re tall, you’ll find decent, but not great leg space in the rear seats. You can fit, but you won’t be as comfortable as you would be in the larger, longer Outback. In the driver’s seat, you’ll find comfortable seats for people of most shapes and sizes. The seating position is excellent. You sit high up, and have a commanding view of the road. The mirrors are large, and you are always aware of where the vehicle is on the road. The model I drove wasn’t fully loaded, but it wasn’t unnecessarily loud. It was fairly quiet, but it could certainly do with more sound insulation. There aren’t many buttons to fiddle with, and there weren’t a ton of options. The interior is somewhat bare-bones. To fix that, you have to step up to the loaded model. Now, let’s move onto how it drives. The Forester is decently quick. Be careful when you’re leaving a stop though, as the throttle tip-in is very aggressive. You’ll scoot across an intersection in no time. One benefit to this is if you’re trying to pass somebody at any speed. The engine can get a little buzzy at higher RPMs, but you never really need to floor it. It’s got more than enough power for everyday driving, and if you want more, Subaru offers a turbocharged engine. The AWD system is great just about everywhere. It turns on a dime. On the test drive, I was able to pull a U-turn on a 2-lane road. Obviously, this is a massive benefit for parking lots, large cities, and off-road. The Forester’s short wheelbase also helps with this. Subaru has been utilizing continuously variable transmissions (CVTs) for several years now, and while I’m not a huge CVT fan, the Forester’s CVT is one of the best on the market. If you’re coming from a car with a conventional automatic transmission, or a manual transmission, it will take a while to get used to no shifting. If you want to have more control over the transmission, the “Sport” mode for the CVT mimics a 6-speed automatic. Is it like an actual automatic transmission? No, but it does a good job of trying! The Forester has light, communicative steering. You can feel the road surfaces, but you won’t be fighting for control of the car if you hit a large pothole or go over a speedbump. It has great suspension tuning. However, a downside to cars with short wheelbases is that they can feel busy on bumpy roads or on the freeway. It’s not a bad thing, but you do have to make constant, small adjustments to keep the car going straight. It has strong brakes, and the brake pedal feels firm. You have a lot of confidence when you’re braking. It’s got a nice engine note. It’s not that classic Subaru rumble, but it doesn’t sound terrible either. While I wasn’t able to take the Forester off-road, there are many owners who have. The short wheelbase and AWD means that the Forester is able to go through mud, snow, down a rutted dirt road, through sand, and over most obstacles with ease. It instills a sense of confidence in the driver, especially if it has all-terrain tires. It should only seem obvious why active people flock to the Forester. It’s got plenty of space, is capable off-road, fun on the road, gets decent fuel economy (I averaged about 26 mpg on the test drive), and is easy and affordable to maintain. Plus, it’s safe (5-star NHTSA overall crash test rating)! I would highly recommend the Forester for: young families, active people, people who need a compact SUV, and those who want reliability and safety. A new Forester will start off anywhere between $22,000-$33,000. That’s before options, of course. But, that’s exactly what all of it’s competitors cost. A used Forester (let’s say 2014 and up) will cost about $20,000 or so. That’s not a bad deal, and you get a whole lot of car for the money. This is a 2018 Forester (image from the Subaru website, all credit given to their talented photographer). This might be my favorite color for the Forester. What’s yours? 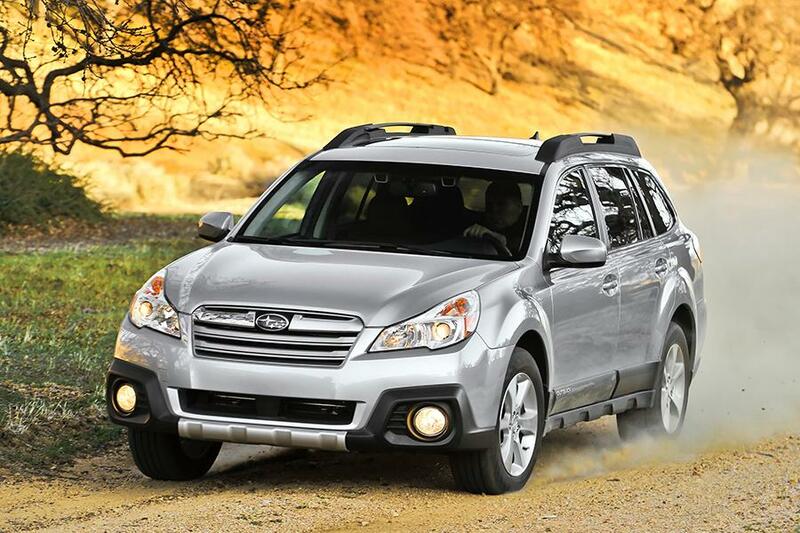 2014 Subaru Outback: Essentially a longer Forester, the Outback is also a staple for many Americans. The 2014 Outback I drove was great. I loved it. You don’t sit as high up as you do in a Forester, but you still have a great view of the road. It’s a bit slower than the Forester, but it has enough get up and go for something it’s size. Neither the Outback nor the Forester are sports cars, no matter how hard they try. But hey, trying hard isn’t a bad thing! Subaru really makes some fun cars to drive! The Outback isn’t as sporty as the Forester, but it’s not what Subaru’s engineers designed it to do. It’s not boring by any stretch of the imagination, but it’s not enjoyable in the way that the Forester is. But I’ll get to that later, OK? Inside the Outback, it’s not nearly as airy as the Forester, but that’s OK. There’s a whole lot more room, especially in the backseat. The interior feels more high-quality as well, despite being the same materials. The seats are even more comfortable, which is an added bonus for long road trips. The backseat has much more space than the Forester. I was able to sit behind my seating position, and have plenty of space. The Outback is much more of a family car than the Forester. The whole interior is much more user-friendly for kids (and adults). Plus, there’s more bells and whistles than the Forester (even in the base model Outback I drove). The trunk is gigantic (the Outback is basically a station wagon branded as an SUV). I could easily fit two bicycles into the trunk without having to fold the rear seat down. Plus, if I wanted to put something onto the roof rack of the Outback, it’s a significantly lower car than the Forester. I wouldn’t have to lift a kayak or mountain bike above my head to put it up, unlike the Forester. The Outback is like a library inside. Even when I floored it and went on a rough road, it was very peaceful inside. Now, how does the Outback ride and drive? Quite well, if I do say so myself. It’s not as busy of a ride as the Forester is, primarily due to it having a much longer wheelbase. As I previously mentioned, the Outback rides much better than the Forester. It’s smooth and quiet. It’s not as quick as the Forester, but it’s got pep aplenty. It’s still got aggressive throttle tip-in, but it doesn’t rocket off the line like the Forester. It isn’t as fuel-efficient as the Forester, but you don’t buy a Subaru for fuel economy. I averaged about 22 mpg on my test drive, but it’s not unheard of for owners to get anywhere from 18-24 mpg. The Outback doesn’t turn quite as well as the Forester (again, long wheelbase), but it still turns well for how long it is. Thank the AWD for pivoting the car around. The steering feels similar to the Forester’s. For all essential purposes, the Outback rides and drives like a more refined Forester. Just like with the Forester, the Outback’s AWD is a wonderful feature. Because the Outback is much longer than the Forester, it’s not as good off-road, but it’s still quite capable. There are a few local vineyards that traded in their trucks for Outbacks because the Outbacks are more comfortable, fuel efficient, and just as capable off-road. If you go camping, kayaking, mountain biking, or have an active lifestyle, the Outback is the way to go. The tradeoff in fuel economy for the added space, the better ride and drive, and cushy seats is well worth it. The salesman told me that the Outback was designed for dirt roads, sand, mud, and snow. It’ll follow a Jeep everywhere but rock crawling. Just like the Forester, the Outback is incredibly safe. Think of it as a larger, nicer Forester. Of course, there’s some downsides to a larger vehicle built on the same platform. You’ll get worse miles per gallon, if you go off-roading, you won’t be able to go as far, and how often will you be using all that space? This is, for all essential purposes, the Outback that I test drove. If I had to choose one of the two, which one would I pick? That’s a hard question, but for me, I would have to go with the Outback. Even though it gets worse miles per gallon, and I probably won’t use all the space it has to offer sometimes, and let’s be honest here: how often am I going to go off-roading? The Outback rides and drives better than the Forester, is much more comfortable, and is an all-around better fit for me than the Forester. Stay tuned for future car reviews! I’m glad to be back and writing! So glad to have you back! I vote with you on the Outback. It looks cooler and sounds cooler. Makes me want to eat a steak. I’m happy to be back! I’ll be making a much bigger effort to blog on a regular basis in the coming school year! The Outback is a great car. I really loved it, but I just don’t think I need something that big. Missed keeping current in the car world! Glad you’re back! Can’t wait to see other cars you are looking at. I’m glad to be back, as well! I know this is a delayed response but it really isn’t as i just worked back thru my emails and came across this post…..so glad to see you back in action….and appreciate your efforts to keep this alive with everything else you have going on. As they say in Aussie…good on ya.